An MIT initiative called "OpenCourseWare" makes virtually all the school's courses available online for free — lecture notes, readings, tests and often video lectures. Strang's Math 18.06 course is among the most popular, with visitors downloading his lectures more than 1.3 million times since June alone. Hand held 600mm is possible! 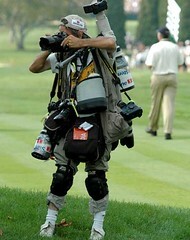 You can never have too much Canon equipment! Sometime the Spy is Spied!!! Spy shot of me & my bazooka lens *Lol on Flickr - Photo Sharing!